The Catalina series is impressive and the Rock incarnation delivers in the same way that the smaller kits do. Well judged savings in shell furniture mean that shells (and heads) are good quality and serve up a sound and feel that befits its impressive physical status. The Rock kit is well judged and delivers big on all counts. It is a limited edition kit, so availability is low. Floor toms are 16"x16" and 18"x16". Finished in the rather tasty White Swirl wrap. The 14"x6½" snare creates a warm response. The shells and heads are good quality. The kit is pretty stripped down in terms of fanciful fittings. Supersized: Gretsch's latest Catalina Series drum kit. The huge 26"x16" bass drum. Big is not always better. Tax bills and mobile phones prove that point fairly well. But as far as drums are concerned, there's always been a large segment of the market obsessed by monster kicks and massive toms, players who prefer the long-wave boom of at least a 24" drum beneath (or in front of) their right foot and the walloping retort of 16" and 18" floor toms. Of course, such set-ups back you into a corner as far as stylistic applications go. They're not versatile all-rounders, and they certainly won't be right for polite jazz-funk, but if you're into the big drum sounds of anyone from John Bonham to Mark Richardson, the only way to get them is to supersize your kit and let it dictate the way you play. 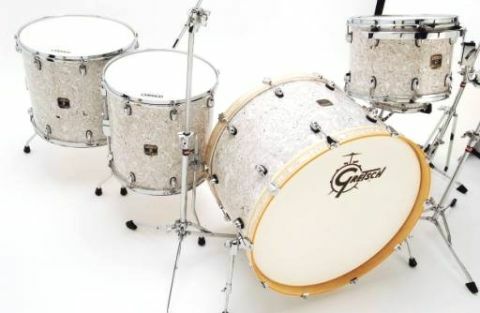 'Supersized' is an accurate description of Gretsch's latest Catalina Series drum kit. The Catalina Club Rock set is by far the biggest kit in the company's good value line-up and miles from the 16" and 18" bass drum standard Catalina Club and Catalina Roll versions. Gretsch say it's a kit to "let everyone know you've arrived", so let's see if it lives up to that claim. The actual statistics of the Catalina Club Rock's ample curves are as follows: 26"x16" bass drum, 14"x10" mounted tom, 16"x16" and 18"x16" floor toms and 14"x6½" snare. And it's not simply their diameters that are eye-catching. This particular set-up is finished in a rather tasty vintage wrap from Gretsch's Nitron palette - the one pictured is called White Swirl and looks fab, but you could also plump for Black Flake if you fancy something a little moodier (and cheaper). The swirl effect of the wrap is welcome on two counts; it suits the 'classic rock' nature of the Rock array, and it's less predictable than a marine pearl or sparkle finish. Plus it will work amazingly well under blisteringly bright stage lights. Aside from its swanky set of clothes, the kit is actually pretty stripped down in terms of fanciful fittings. That's not to say that everything isn't entirely serviceable and up to the task, but the lugs are simple, hoops are straightforward triple- flanged jobs (other than those on the kick drum, which gets White Swirl-festooned wood hoops), the bass drum spurs are hefty but uncomplicated affairs and the snare throw-off is hardly esoteric either. But rather than an image of bargain basement corner cutting, the kit has an air of the honest-to-goodness about it. Built in Taiwan, the Catalina range is far from Gretsch's flagship series, but the fact that you're not not paying for flashy, easily marketable features, can only be a good thing. Admittedly the odd tuning rod proved a trifle stiff, but other than that the kit hangs together in confident fashion without histrionics. More important than whether the bass drum claws are rubber-lined (at this price point at least), is the quality of the shells themselves. All-mahogany types are used for each of the drums that go to make up the Rock kit and each has a 30º bearing edge. Edges are pleasingly well cut, which will please those with an eye for such things, and shows that while fixtures and fittings might be simple, the Far Eastern production facility from which these kits emanate is keeping a close eye on construction details. All the Rock drums are mahogany shelled and this includes the deep 14"x6½" snare, which is no bad thing. While a decent steel, brass or copper snare would work equally well with this set-up, there's something 'right' about this snare completing the kit. And in terms of saleability, a wood shell snare is still a very real plus point on a spec sheet. While we're on the subject of the snare drum, it's as good a place as any to start discussing the merits of the Catalina Club Rock tone. A lack of reinforcing hoops, that 6½" depth and a decent head create a highly acceptable warm but clear response. The drum was left undamped for this review, and although there was a hint of unruly 'boink' now and again, such was the appeal of the lively, crackly retort that we weren't inclined to smother it and lose the character of the instrument. In any case, it would have been disguised by the sound of the rest of the kit on stage. The use of excellent Evans G1 heads on the Catalina Rock toms and snare does the kit nothing but favours. Straight from the box you're faced with a set that feels more grown-up than its price tag might suggest, and whether the G1s are your usual tipple or not, there's no denying that they sound good on these big ol' boys. The toms are noticeably fatter and thicker-sounding than the snare, but the shallow 14" still responds quickly and that plummy edge to their voice means they sound gorgeously funky-retro. Of course the size of the floor toms in particular means that fusion-ish flurries aren't well-served, but walloping great rock fills sound just as they should; imposing, authoritative and muscular. Underpinning the throaty toms and cracking snare is the unmissable 26" kick drum. And you know what this one's going to sound like, don't you? Well, you may and you may not. Yes, it's a low-pitched, booming beast, but it reacts to pedal strokes more quickly than you'd expect, thanks to the relatively shallow 16" depth, and it's not quite as verbose as the size might suggest. Were we dealing with a top-end DW, Brady or even Gretsch 26" kick here there's little doubt that it's voice would be more strident and all-enveloping than that which we have here. But that's not to say this one is disappointing. In fact it's more controlled tone works to its advantage. Factoring in the reasonable price, picking holes is like checking horses' teeth. The fact that several manufacturers are making big kits available at sensible prices is positive and makes the mid-priced drum market a more interesting place than it might otherwise be.